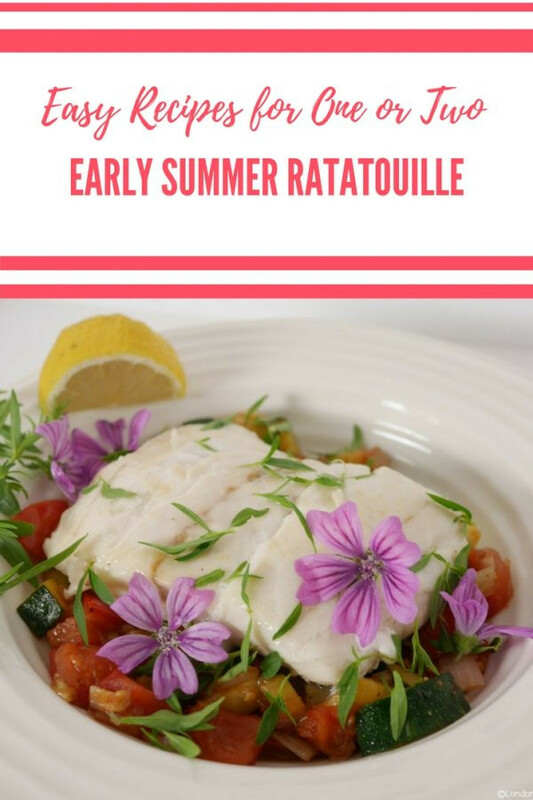 This ratatouille recipe is really an early summer dish – when the first vine tomatoes are really ripe and there are young, fresh courgettes available. 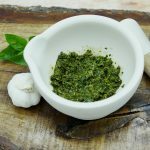 Very simple to make, it keeps well in the fridge for three or four days, works cold with a salad or warmed up to serve with lamb, chicken or white fish. Traditionally, ratatouille is a mixture of aubergine, courgette, onions and tomatoes cooked with a whole host of other vegetables and herbs sometimes added. My early summer ratatouille uses shallots for extra sweetness and omits the aubergine, simply so that the dish can be cooked quickly and isn’t too expensive. Dicing all the vegetables helps too, and at this time of the year, I want to let the flavours of Spring linger on. Later in the summer I’ll make a more traditional version with slices of courgettes and aubergine slowly stewed with tomatoes and olive oil, but I like the freshness and lightness of this version. I came home from a recent trip to the Rhone valley fired up with enthusiasm for foraged food and fresh herbs. More of that later…one edible flower that is available pretty much everywhere is the mallow. It’s a pretty purple flower with an edible seed case that my Mother used to call ‘fairy cheese’ because it looks rather like a tiny baby bell (without the red wax). If like me, you are a Townie, this is something you should be able to find on any bit of waste ground. Just make sure you pick the flowers from somewhere that is away from dog walkers…and that you wash anything you pick very well! I used my handful of mallow flowers to decorate the plate of pan-fried hake served with lemon on a bed of courgette ratatouille in the top picture. And, it was there too, that I worked out what my mystery pot of herbs was, as we wandered through the village picking up sprigs of all sorts of wild herbs. And, traditional Ratatouille also comes from the area we were visiting, the Occitan, Provence and Nice. The word ratatouille comes from Occitan ratatolha and the recipe comes from Occitan cuisine. So I guess I was already pining to return. Peel and chop the shallots and crush the garlic. Dice the tomatoes and courgette into 1/2 cm cubes. Pull the savoury leaves off the stalks and discard the stalks. Add the diced courgette and cook for a further 3-5 minutes till it starts to change colour. Add the tomato, season with salt and pepper and cook for 5-10 minutes, stirring frequently to make sure nothing is burning. Stir in the balsamic vinegar and most of the summer savoury. Taste and adjust seasoning if necessary. If your tomatoes are not ripe enough you may need to add a teaspoon of sugar at this stage. Stir through until completely mixed in. Garnish with a few more savoury leaves. 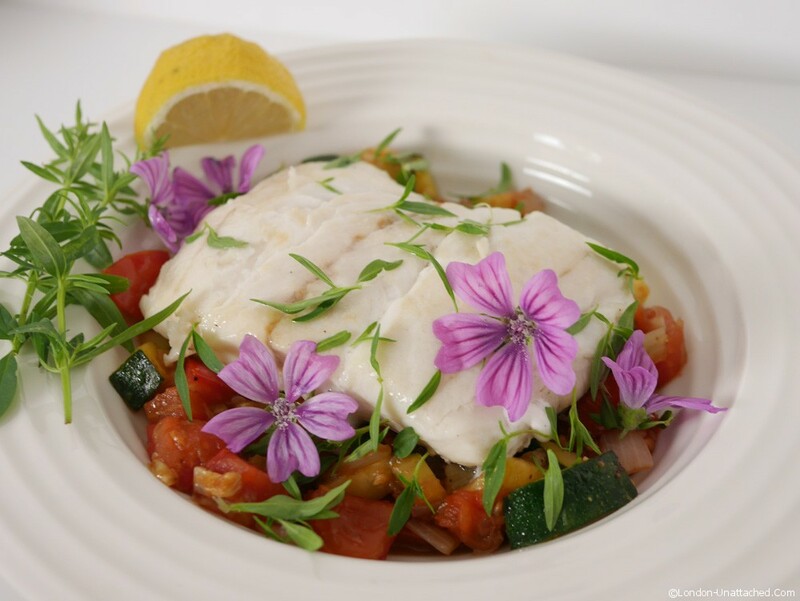 If you want to completely recreate my fish dish, you simply need a good fillet of hake or cod (mine comes from John at Delish Fish), a little salt and an extra tablespoon of olive oil. About an hour before you want to eat, sprinkle the fish with salt to drain out any extra liquid. Then, five minutes before the ratatouille is ready, heat up the oil in a small heavy-bottomed frying pan, rinse the fish and pat dry with a clean tea-towel or kitchen paper. Pop it ‘service side down’ (e.g. with the skin on top) for a minute then flip it over, turn the heat right down and cook till you can just see the proteins rising to the top of the fish and it is opaque all the way through. Pop the fish on top of a bed of ratatouille and garnish with whatever fresh herbs you are using and a lemon quarter. This makes a good low-calorie dish if you happen to be following the 5:2 diet like me or any other kind of diet for that matter. One thing this dish does depend on is a really good balsamic vinegar. I was recently sent a couple of bottles of Due Vittorie, Italy’s favourite IGP Balsamic Vinegar, to sample. 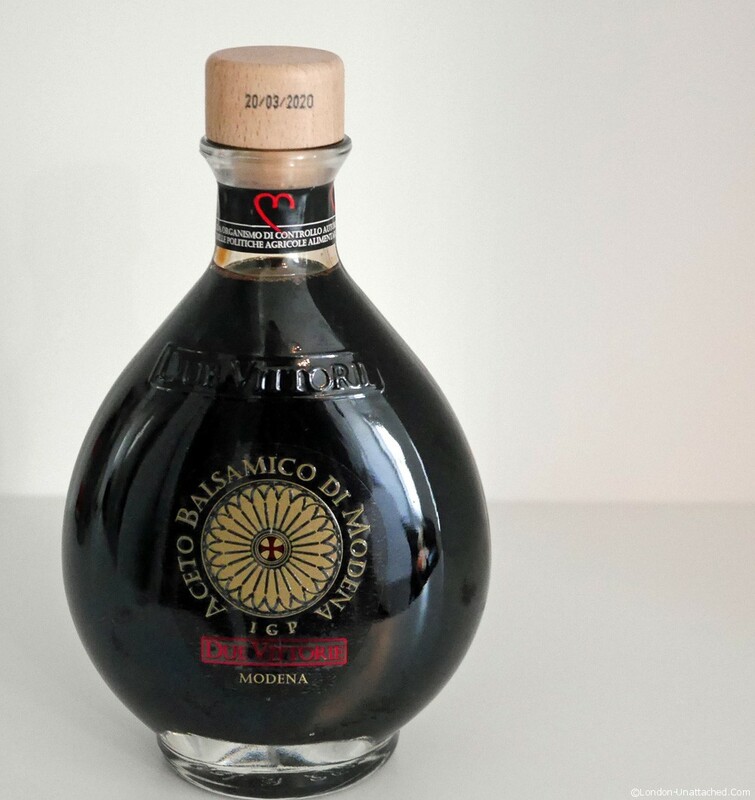 It’s a rich, sweet, Balsamic Vinegar that has been produced in Modena, Italy, since the Middle Ages and is now famous throughout the world. For this recipe, I used just a couple of teaspoons of Oro, which you can buy through Ocado for £9.99 a bottle. It’s quite different to the thin, sharp vinegar you might have tried already. If you don’t have a good Balsamico, I’d suggest adding a tablespoon of dry wine instead, because anything too strong will completely overwhelm the delicate early summer vegetables. I’ll be running a giveaway though, so keep your eyes open for your chance to win a bottle for yourself. The Courgette Ratatouille is a great ‘cooking from scratch’ dish for a single household. Although it makes enough for two or three meals, it cooks quite quickly, keeps well and can be used in a number of ways. Try a spoonful on top of a jacket potato, topped with grated cheese and popped in the oven for a few minutes. Or eat it cold. You can even use the mixture to make a delicious omelette filling. Sounds delicious – ratatouille’s such a versatile dish, must try this version. Tried and tested many times – just throw in some crusty bread ! Having just finished working on a film with all meals catered, I quickly realised, after weighing myself this morning, that it’s time to relaunch the 5:2 diet again….and this looks just like the recipe I had in mind for my supper. Love summer savoury, particularly good with fresh beans……its German name is in fact “bean herb”. It’s a good staple isn’t it – though you do need to be a bit careful with the olive oil! Ooh I like your summery version of ratatouille Fiona. I’m not desperately keen on aubergine and the summer savoury and mallow are lovely additions. Looks so pretty with the mallow flowers. I don’t use courgettes enough in recipes!